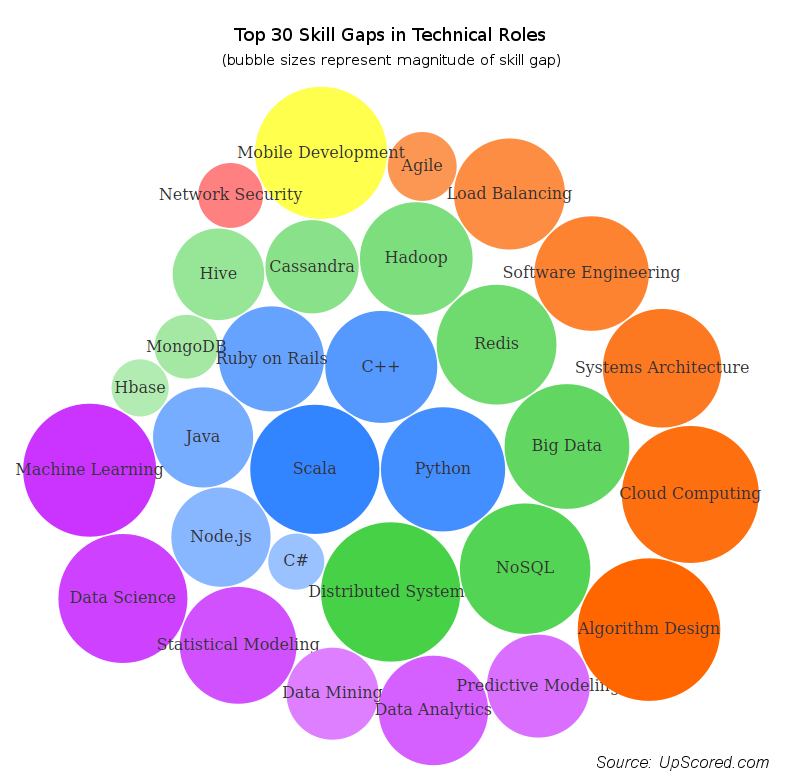 Posted on Nov. 30, 2015, 12:26 a.m.
What are the biggest skill gaps among technical roles? We’ve been fielding a lot of questions from our users on what skills are in highest demand. Luckily, we’re not short on data. So, we decided to explore the topic in more depth. Before we dig into our findings, we’ll tell you how we got there. We based our research on approximately 500,000 resumes and over 13,000 open job descriptions with the goal of analyzing the top "skill gaps" among technical roles. To offer more clarity, we recognize “skill gaps” as skill keywords that appear proportionally more frequently in job descriptions than in candidate resumes. The data was scaled across 2,500 keys to identify the skills with the biggest differences between demand (jobs) and supply (resumes). Okay, really, what is the trend? Demand for skills associated with NoSQL technologies has clearly outpaced supply. "NoSQL,” "Redis," "Hadoop," "Cassandra," and "MongoDB" were among the top 15 scarcest skills. Interestingly, relational database SQL technologies such as “Oracle,” “MySQL,” and “SQL Server” are at a slight surplus. For example, we’re seeing skills like “MySQL” appear more frequently in resumes than in actual job descriptions. Intuitively, this may not come as a huge surprise: as companies are collecting more and more data, it’s likely many are switching to newer database technologies over relational database systems. They will need employees who can manage these systems. As candidates, how do we keep up? Sign up for the UpScored platform here to see how your skills match up to top jobs in NYC.